Strange Music and Tech N9ne are proud to announce Rittz as the latest addition to the independent giant. In front of a sold-out, hometown crowd in Kansas City, Missouri Tech N9ne officially introduced Rittz to the welcoming fans. The overwhelming roar of approval solidified Strange Music and Slumerican joining forces. 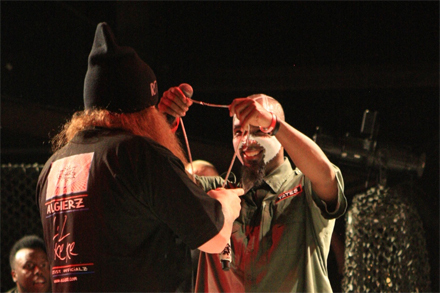 The icing on the cake was Rittz receiving his diamond-encrusted Snake and Bat chain from the hands of Tech N9ne himself. Rittz’s signing will see Strange Music and the Slumerican movement joining forces. According to Rittz, Slumerican is defined as a philosophy that drives the masses of fans that he has accumulated over the years of his relentless presence online, on wax, and on the stage. Bringing these two forces together is just another example of how Strange Music continues to expand its reach – continuing to build a hip hop empire from the ground up. Rittz plans to drop his Strange Music debut album in 2013, so be on the lookout for White Jesus! Welcome Rittz to the Strange Music family and leave a comment below!